The DeadShot TreePod provides true bench rest accuracy from any tree stand. It holds your gun securely in the ready position while freeing up hands for binoculars range finder or warm pockets. The innovative multi bearing swing arm system provides smooth and stable movement from extreme angles left to right with minimal body movement. Combined with a tension adjustable updown tilt function the rest easily allows for precise alignment across the entire range of possible shooting angles. The upper portion of the rest adjusts in length and balance point to accommodate any gun or crossbow. Its rubber over molded front and rear forks along with a retention strap ensure your weapon is held securely at all times. The universal mounting base consists of two steel plates and a height adjustable center support shaft that securely attach to most any tree stand platform. 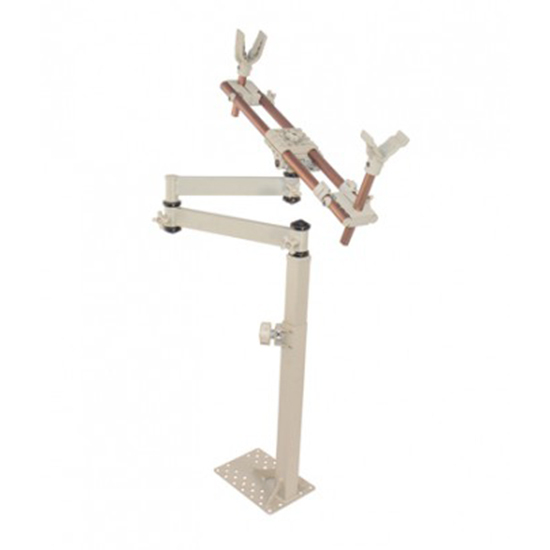 The upper rest with swing arm assembly easily detaches from the mounting base for transport. Constructed of anodized aluminum and powder coated steel for maximum stability and durability.